Process and plant engineers in search of a high-accuracy, virtually no-maintenance gas or liquid flow meter for small line sizes will want to learn more about the new cost-saving direct mount configuration for McCrometer’s popular Wafer-Cone Flow Meter. The Wafer Cone’s new direct mount configuration minimizes installation labor while ensuring accuracy. Direct mounting the transmitter eliminates impulse lines, which not only lowers installation costs but also reduces potential leak points by more than 50 percent. Simple plug-and-play mounting ensures the meter is installed correctly the first time and eliminates a potential source of flow measurement errors. There’s virtually no need to come back and check whether or not the meter was installed properly. The advanced Wafer-Cone Flow Meter is ideal for gas or liquid service in line sizes from 1 to 6 inches. The meter’s flangeless design makes installation fast and easy, while the interchangeable cone offers flexibility to accommodate changing flow conditions without the need for recalibration. When flow conditions change over time, the cone can be removed and replaced with a cone at a different beta ratio eliminating the need to buy a new meter. Space-saving and field-proven, the Wafer-Cone Flow Meter can be installed virtually anywhere in a piping system or be easily retrofit into an existing piping layout. No moving parts, virtually no maintenance and an economical price make it ideal for applications including: natural gas wellheads, CO2 and water injection, gas lift, compressor anti-surge, fuel gas, separator discharge, biogas reactors, cooling systems, plant HVAC, process gas lines and more. Using the same robust cone design as the V-Cone, the Wafer-Cone technology offers cost-of-ownership advantages over traditional differential pressure (dP) technologies such as the orifice plate. The beta edge of an orifice plate wears down over time requiring labor intensive replacement of the plate in order to maintain accuracy. 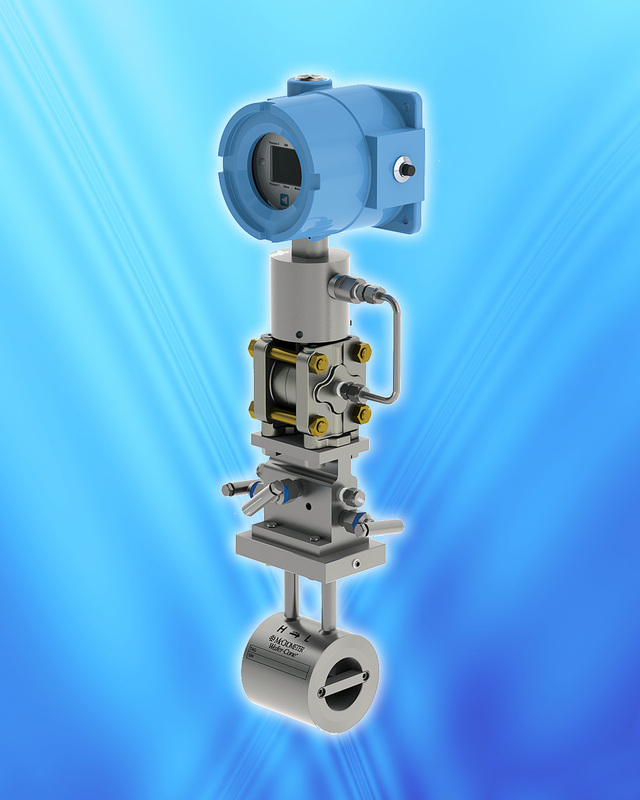 The Wafer-Cone Flow Meter’s unique differential pressure sensing technology with built-in flow conditioning greatly reduces the required straight pipe run for installation as compared with technologies such as orifice plates and venturi meters. The Wafer-Cone is highly accurate requiring only 1-3 straight pipe diameters upstream and 0-1 straight pipe diameters downstream. Its ability to self-condition flow makes it a space-saver, allowing for a reduction of the overall footprint and weight. The Wafer Cone Flow Meter’s built in flow conditioning and resulting stable flow profile achieve an accuracy of +1.0 percent, with a repeatability of +0.1 percent, and operates over a flow range of 10:1. The Wafer-Cone raises the bar for economy, ease of use and performance. The Wafer-Cone‘s design features a centrally-located cone inside a tube, which interacts with the fluid flow and reshapes the velocity profile to create a lower pressure region immediately downstream. The pressure difference exhibited between the static line pressure and the low pressure created downstream of the cone can be measured via two pressure sensing taps. One tap is placed slightly upstream of the cone and the other is located downstream of the cone. The pressure difference can then be incorporated into a derivation of the Bernoulli equation to determine the fluid flow rate.